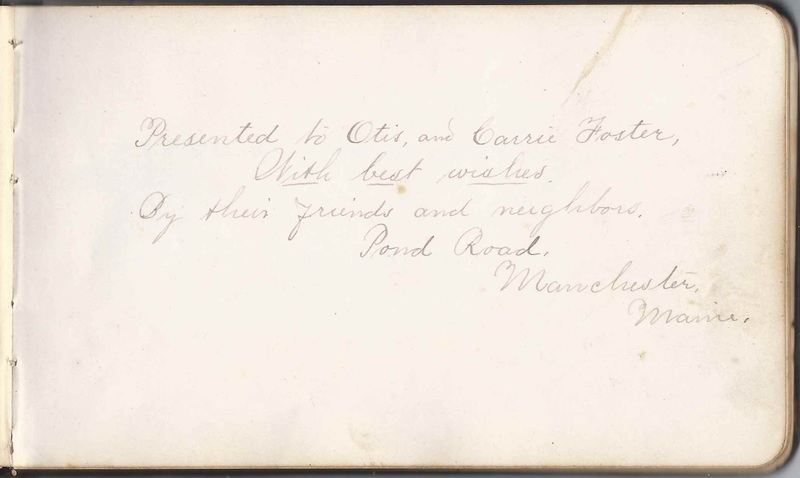 1880s - 1911 autograph album that was presented to Otis J. and Caroline R. (Pease) Foster about 1884, by their neighbors on Pond Road in Manchester, Maine. The album is approximately 7" x 4-1/4" and contains the sentiments of 44 of the Fosters' relatives, neighbors and friends. An alphabetical list of the signers appears at the end of this post. Several of the pages have a note added at a later time indicating that the signer had died; these are noted in the alphabetical list. Otis J. 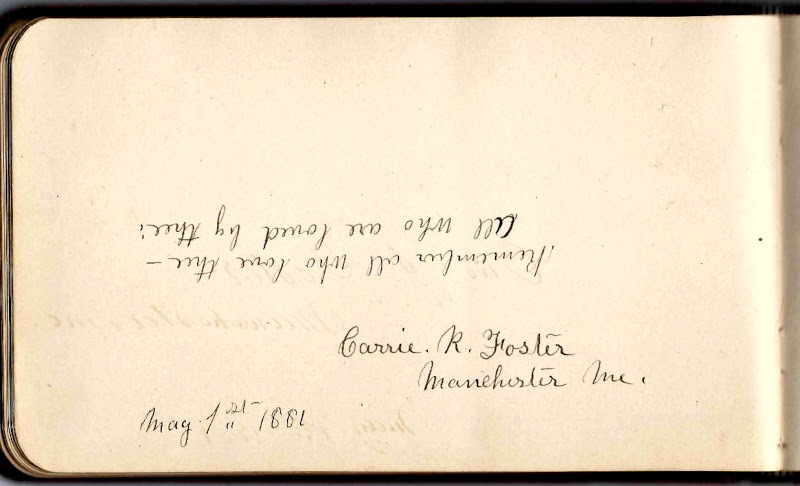 Foster and Carrie R. (Pease) Foster signed pages in the 1880s autograph album of Elsie Rhoda Sampson of Manchester, Maine, which features many of the same surnames. Otis J. 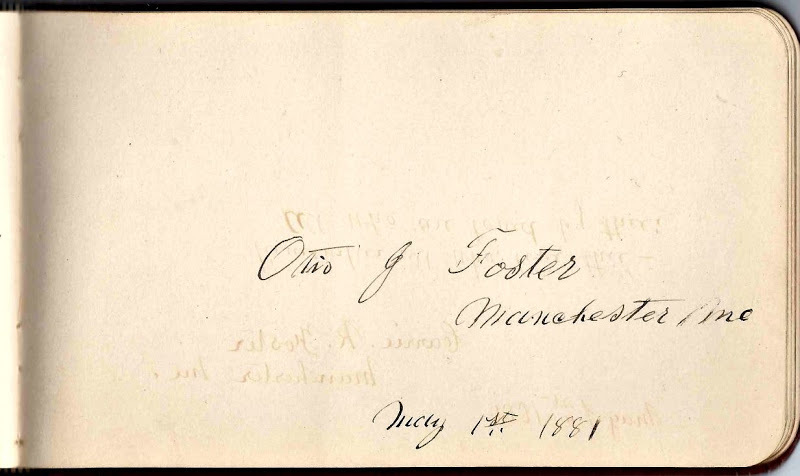 Foster was born 10 February 1841 in Maine, perhaps at Freeman, the son of George and Mary Polly (Whitney) Foster. On 7 March 1869 at Augusta, Maine, he married Caroline R. (Pease) Hanson, widow of Nils A. Hanson and daughter of Daniel B. and Rachel (Church) Pease. Caroline, "Carrie" was born 2 March 1848 at Augusta, Maine. Both Otis and Nils were veterans of the Civil War. It was presumably Carrie R. (Pease) Hanson Foster who added a page with information on her maternal grandfather Randell Church, or Randall Church, including his death date of October 14, 1879 at the age of 98. Carrie died in 1911, and Otis in 1920. If you have corrections and/or additions to the information above, or information on any of the signers listed below, please leave a comment or contact me directly. 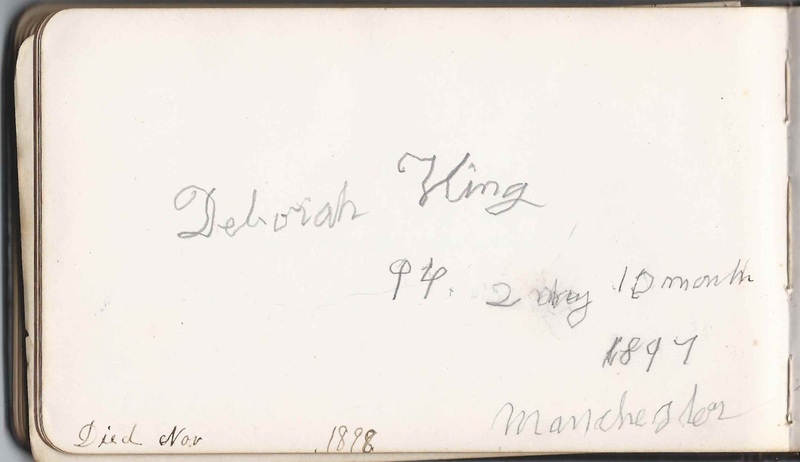 One page with an added note was that signed by Deborah (Robbins) Wing, who was 94 and ten months when she signed her page in 1897. The later note indicated that she died in November 1898. Her surname appears to be King, but it was Wing. Another such page had the awful note: "Burned to death, 1900". This was the page signed on November 4, 1884, by Emeline C. Myers, whose husband James signed the overleaf. Emeline was Emeline C. (Hawkes) Myers, born 28 January 1813 at Gardiner, Maine, daughter of Lemuel and Abigail (Winslow) Hawkes. Emeline died 27 April 1900 at the age of 87. 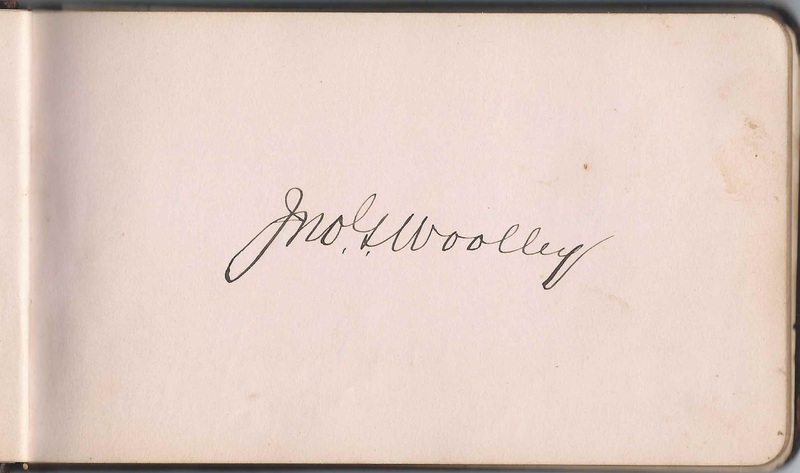 Several of the Woolley family signed pages, including parents John Granville Wooley, his wife Mary V. (Girhard/Gerhardt) Wooley and sons John Rea Woolley, Ned Wooley and Paul Wooley. John Granville Wooley was a presidential candidate on the Prohibition ticket. A reformed alcoholic, he had traveled the nation giving speeches and may have encountered the Otis family during a stop in Maine. Son Paul signed when he was a student at the Friends School at Providence, Rhode Island. Joshua B. Brown of Manchester, Maine. His wife Adaline A. (Dow) Brown signed the right facing page. Mrs. Serepta D. Church of Taunton, Massachusetts. She was Serepta Diana (Wood) Church, wife of Stephen L. Church, a Maine native, who signed the right facing page. 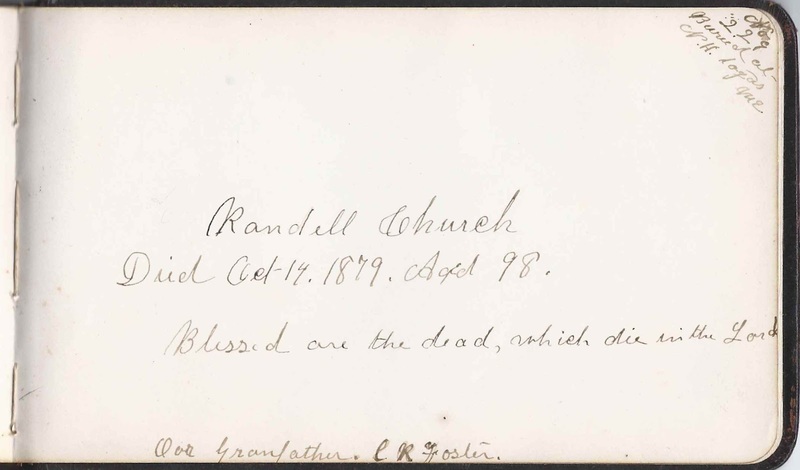 He wasn't a signer, but Carrie, presumably, inscribed the page about "Randell Church, Died October 14, 1879, Aged 98". "Our grandfather, C. R. Foster" "Buried at N.H., Togus, Maine". Randall Church (1782-1879) was the maternal grandfather of album owner Caroline R. (Pease) Foster. Stephen L. Church of Taunton, Massachusetts. He was born about 1823 in Maine, son of Randall and Elizabeth (Chace) Church, and husband of Serepta Diana (Wood) Church, who signed the left facing page. Later note: "Fallen Asleep"
Henry E. Farr of Manchester, Maine. Later note: "Gone on before"
Rhoda L. Farr of Manchester, Maine. She was Rhoda L. (Dow) Farr, wife of Thomas Farr and mother of signer Cynthia Maria (Farr) Jones. Sylvia A. Farr. She was Sylvia A. (Trask) Farr, wife of Henry Earle Farr. They lived at Manchester, Maine. Alfred W. Hawkes of Manchester, Maine, signed on November 3, 1884. He was the son of signers Isaac Warren and Sarah (Sampson) Hawkes. Edgar S. Hawkes of Manchester, Maine, signed on November 3, 1884. He was the son of signers Isaac Warren Hawkes and Sarah (Sampson) Hawkes. I. Warren Hawkes of Manchester, Maine. He was Isaac Warren Hawkes, whose wife Sarah (Sampson) Hawkes signed the right facing page. Lucie J. Hawkes of Manchester, Maine, signed on November 3, 1884. She was the daughter of signers Isaac Warren Hawkes and Sarah (Sampson) Hawkes. Sarah S. Hawkes of Manchester, Maine. She was Sarah (Sampson) Hawkes, whose husband Isaac Warren Hawkes signed the left facing page. Cynthia M. Jones of 561 Haddon Avenue, Camden, New Jersey. She was Cynthia Maria (Farr) Jones, whose husband James Nelson Jones shared the page. Cynthia's mother, Rhoda L. (Dow) Farr, also signed a page. J. Nelson Jones of 561 Haddon Avenue, Camden, New Jersey. He was James Nelson Jones, born in Maine in 1848, whose wife, Cynthia Maria (Farr) Jones, shared the page. Cynthia's mother Rhoda L. (Dow) Farr also signed a page. James Martin of Manchester, Maine, signed on October 6, 1892. His wife Avis (Tremills) Martin signed the right facing page. Mrs. Avis Martin of Manchester, Maine, signed on October 6, 1892. She was Avis (Tremills) Martin, whose husband James Martin signed the left facing page. E. R. Mayo. He was Edwin R. Mayo, by then of Manchester, Maine, whose wife Mary Dunlivia (King) Mayo signed the right facing page. Mary D. Mayo, signed at Manchester, Maine, on November 3, presumably 1884. 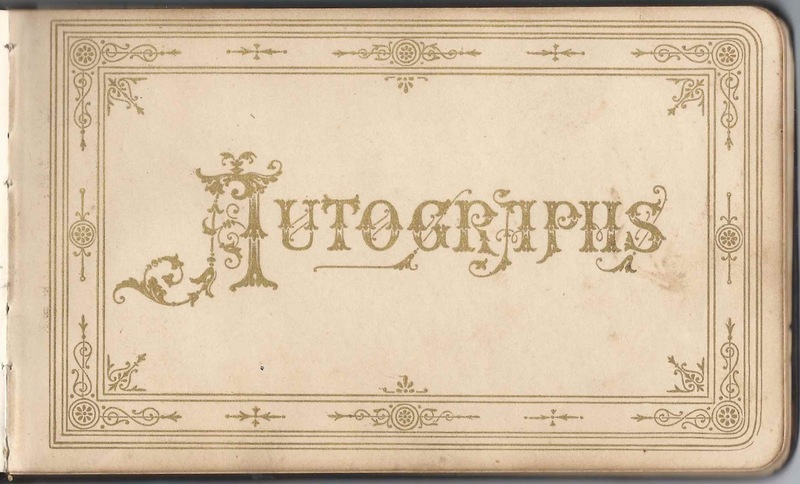 She was Mary Dunlivia (King) Mayo, whose husband Edwin R. Mayo signed the left facing page. 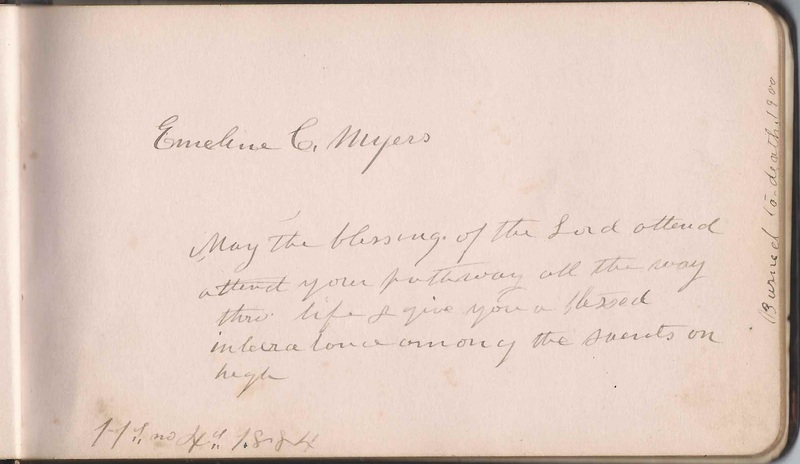 Emeline C. Myers, signed on November 4, 1884. Later note: "Burned to death, 1900". She was Emeline C. (Hawkes) Myers, born 28 January 1813, daughter of Lemuel and Abigail (Winslow) Hawkes. Emeline married James Myers on 16 August 1837 at Gardiner, Maine. She died 27 April 1900 at age 87. James Myers signed the overleaf. James Myers, signed at Manchester, Maine, on May or August 18, 1884. Later note: "Both have fallen asleep in Jesus". James' wife Emeline C. (Hawkes) Myers signed the overleaf. Charles P. Sampson of Fort Fairfield, Maine, signed at Manchester, Maine, on November 3, 1884. Later note: "Called early in life"
Mary L. Sampson of Manchester, Maine. She was Mary Louise (Dorman) Sampson, third wife of Proctor Sampson, who signed the left facing page. Proctor Sampson of Manchester, Maine. His third wife Mary Louise (Dorman) signed the right facing page. Proctor was the father of signer Sarah (Sampson) Hawkes. Later note: "At Rest"
G. S. Sleeper of Winthrop, Maine, on August 22, 1886. He was George Snell Sleeper, who shared the page with his wife Charlotte Deborah (Wingate) Sleeper, "Lottie"
Mrs. Julia A. Wilder of Hallowell, Maine, signed on November 4, 1881 Later note: "Died 1900"
Deborah Wing signed at Manchester, Maine in 1897, noting she was 94 years and ten months old. Later note: "Died Nov 1898"
Sarah E. Wing, signed at Manchester, Maine, on November 3, 1884. She was Sarah E. (Sleeper) Wing, whose husband Willis H. Wing signed the left facing page. Willis H. Wing of Manchester, Maine, signed on November 3, 1884. His wife Sarah E. (Sleeper) Wing signed the right facing page. Jno. G. Woolley; presumably John Granville Woolley, prominent temperance speaker and Prohibition Party candidate for president in 1900. 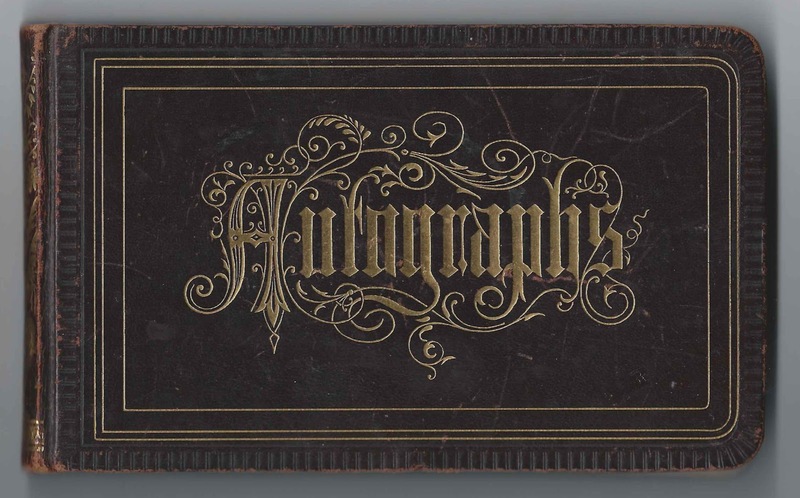 Other members of his family also signed pages in the album, including his son John Rea Woolley, a Madison, Wisconsin, photographer. Mary G. Woolley, signed at Manchester, Maine, on September 18, 1888. She was Mary V. (Girhard/Gerhardt) Woolley, wife of signer John Granville Woolley and mother of signer John Rea Woolley. Paully Woolley, signed at the Friends School at Providence, Rhode Island, on September 10, 1888. He was Paul G. Woolley, son of signers John Granville Woolley and Mary V. (Girhard/Gerhardt) Woolley.